Two goals in two minutes led to a road point for the Sounders against Toronto FC at BMO Field Saturday. 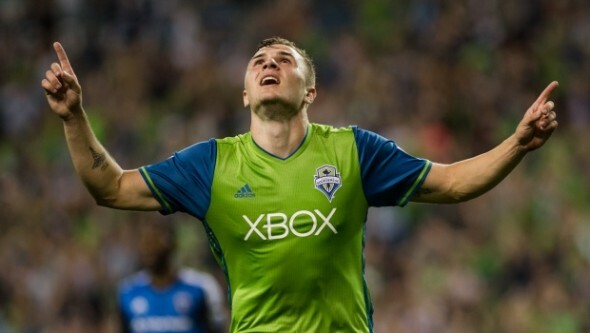 Jordan Morris delivered the goods for Seattle. After going down a goal in the 60th minute, the Seattle Sounders responded within a minute to pick up a point on the road Saturday against Toronto FC. Jordan Morris scored his sixth goal in the 1-1 draw in Seattle’s first of eight matches in July. Coach Sigi Schmid said he was content with the draw. “We’re happy,” Schmid said. “We went down 1-0, but we came back right away. On the whole, they were probably the better team, but sometimes that’s the way it goes and you’ve still got to grab something. I’ve been really happy the past two games, we’ve gone out and gotten ahold of something. Toronto’s score came when Sebastian Giovinco pulled down a long ball and bounced a shot off Stefan Frei. The rebound fell straight to Jordan Hamilton, who easily converted. Seconds later, Joevin Jones picked out Morris with a long vertical ball. Morris cut the ball back to the middle of the box, shaking his defenders before curling a right-footed shot into the far side of the net. Seattle (5-9-2) almost took the full three points from Toronto (5-6-5). Morris cut in a low cross in the 87th minute that found the foot of substitute Herculez Gomez and rolled towards net, but it was turned just outside of the post by midfielder Mark Bloom. Chad Marshall walked off in the 51st minute with an apparent injury, immediately heading up the tunnel with the Sounders training staff. He was replaced by rookie Tony Alfaro, who ably filled his spot containing Giovinco, the 2015 MVP. The Sounders again played without Clint Dempsey, who played all six games for USMNT in Copa America and was given the game off to rest. Brad Evans also sat out with a leg injury. A point on the road may not scream of the breakthrough the Sounders so desperately seek, but it does represent an improvement. The Sounders look to further things against Western Conference rival Los Angeles at home July 9 (12 p.m., ESPN). Not a win but better than losing. And they get points from it still. Hoping that Evans and Dempsey can come back fresh and get the club back on track.